Handling and storage of liquid manure requires planning and consideration of the best fit for the entire system. Below are some descriptions of common liquid manure systems. Liquid manure containing 5 percent solids or less generally results from the addition of washwater or rainwater to manure. Examples of liquid manure sources include lagoons, holding ponds and dairy parlor washwater. 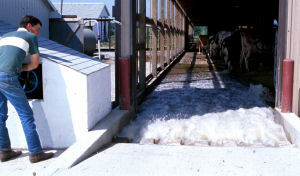 A typical example of a collection system resulting in liquid manure is the flush removal of manure from a dairy freestall barn. In this scenario dilute lagoon wastewater is pumped into flush tanks which in turn release the water into freestall alleys to wash the manure to the lagoon. Flush water released into dairy freestall alleys dilutes manure and washes it to the lagoon. Another form of dilute or liquid manure is runoff from lot surfaces. In these cases, most of the manure solids remain on the lot, or are removed by solids separation devices prior to a lagoon or holding pond that receives the runoff. The runoff then contains primarily fine suspended or dissolved solids that result in dilute liquid in the receiving basin. Runoff holding ponds for beef feedlots typically contain dilute wastewater with less than 5% solids. Liquid manure (less than 5% solids) is less difficult to handle hydraulically with pumps and pipes than the thicker slurry-type manure. Equipment designed to handle irrigation water is often suitable for handling the dilute wastewater found in liquid manure systems. However, operators often elect to use the same pumping and handling equipment for liquid manure as for slurry manure. This practice provides for the possible need to handle manure that may be occasionally thicker than anticipated and reduces the likelihood of plugging. Conventional irrigation equipment may be suitable for handling dilute manure from certain lagoons or runoff holding ponds when the likelihood of encountering solids at problem levels is remote. In these cases, pumps designed for irrigation (typically more efficient than slurry manure pumps) will usually be acceptable for handling the wastewater. Conventional irrigation pumps can handle manure wastewater with limited solids content. Conventional irrigation application equipment can also be used to land apply dilute manure wastewater if solids levels are low enough to preclude plugging nozzles and orifices. 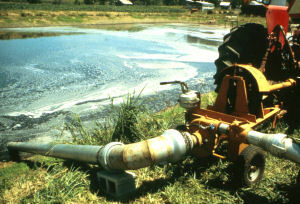 Traveling guns have been used for many years for surface application of effluent from lagoons and runoff holding ponds. Traveling guns are applicable to small and irregular fields and thus find acceptance in areas where crop fields may be limited in size by terrain, timber or property boundaries. Center pivot systems are also able to handle dilute wastewater and are applicable where fields tend to be larger and reduced labor for land application is desired. This traveling gun applies dilute manure wastewater to a growing crop as it travels across the field. 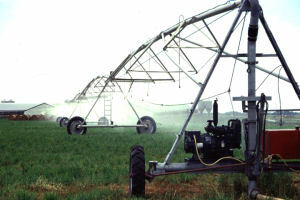 Center pivot irrigators can apply dilute manure wastewater with low labor input.